That's Jasper's motto, "Everything is a toy." At one point, Lenny thought we ought to rename our cat, Buttons. If you were wearing a shirt with buttons, he would climb into your lap on the pretext of being petted, only to start chewing on the buttons. I snagged these shots of him attacking one of Lenny's shirts so innocently left lying around for a little kitty cat to play with. He loves zippers, too. Actually anything that moves and a lot of things that don't. He has calmed down a lot in the year we've had him but is still a playful kitty - between naps of course. I had this layout in my head for a long time. It tells the story of how Lenny wanted to name my sweet little kitten - Roscoe and I objected. No offense to anyone named Roscoe, I just kept thinking of the Dukes of Hazard. Anyway, I picked Jasper because Jasper, Alberta, Canada was one of the places we visited on our honeymoon. It was gray, misty and foggy a good part of the time but still beautiful. This is a digi-fusion or hybrid layout. The background paper, photos, the swirl, titles and journaling are all done in Photoshop Elements and printed at one time. 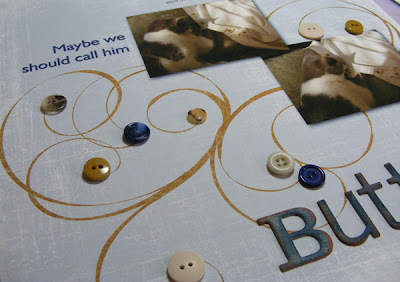 Then I added the buttons and chipboard title. Ink: Night of Navy and Really Rust from SU! 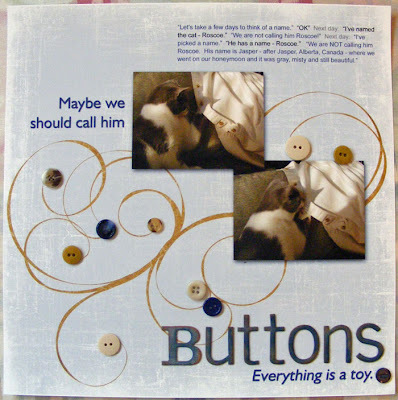 Buttons: Variety of sources - many are those extras they attach to clothes which I clip off and never really need.